Arc Cafe in Circular Quay, is a coffee, cake and sandwich establishment, which is designed to suit anyone enjoying a great day or weekend out along the quay, and the location is just great as well. Why? You are getting great glimpses of the Sydney Harbour Bridge. My only qualm would be that it can be a challenge (especially at lunchtime, and also depending on the time of day you come here) to obtain a suitable table. Simple establishment, more like a healthier fast food alternative. The sandwiches aren't too bad, although their coffee with a spoon of sweetener (as opposed to sugar) means a quality latte; better to sit down and enjoy before moving on. However due to the popularity of the tables - take away appears to be the only option. A magnet for families, mums and their prams, as well as families with a group of children, and especially as you have the occasional street theatre performances nearby, this establishment gets really busy. The service is an important factor, it isn't too bad, although you are served quite quickly in most cases. Love the glimpses of the Sydney Harbour Bridge. You just have to really want a coffee for this experience to be worth the wait. If you want a break from McDonald's, City Extra, Rossini's or from any of the take-away sandwich shops in and around the quay, then give this establishment a go for their quality focaccias. Why? 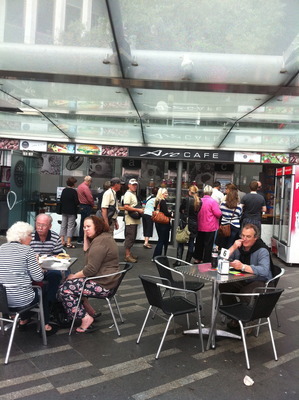 For coffee at Circular Quay, and for a healthier fast food alternative.